Who are Stephen Colbert’s first guests on The Late Show? One week from tonight–that's Monday, September 8th, Stephen Colbert will debut his brand-new iteration of The Late Show over on CBS. 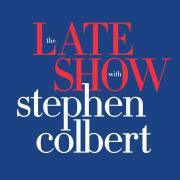 In order to build joyous anticipation, Colbert has announced his first two weeks' worth of guests. Who are Stephen Colbert's first guests on The Late Show? The answer...may surprise you. What’s the real Stephen Colbert actually like?